The person who has everything. The one who's hard to shop for. The gifter who hasn't had time to shop. The giver who can't decide on a gift. Whether it's on the giving end or the receiving one, we've all been there before. But there is a solution to those gifting problems, at least if you're shopping for the health and wellness-focused individuals on your list. Enter KLUTCHclub, the monthly subscription service that specializes in fitness, health and wellness. For roughly $17 per month ($25 when you add shipping costs), KLUTCHclub members receive a hand-picked, themed box full of holistic health, fitness and wellness products. The box itself is full of items valued at $50 or more. It's a simple way to learn about new brands and products that fit the healthy lifestyle (or can encourage one to jump on the healthy train), and receive exclusive deals and offers from companies that share those values. For anyone looking for a last-minute gift--and you're not ready to resort to a rush order from your favorite online retailer just yet--it's a no brainer to go with a KLUTCHclub box. You're getting more than what you're paying for, you can send it directly to the recipient, and you've giving what sounds like an awesome assortment of goodies with different boxes of treats for men and women. And you can choose from a selection of box options, from the yearly subscription with one box per month to the 'best of' box that's full of the club's favorite items. Take December's boxes, themed for New Year's resolutions. 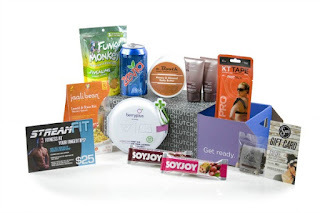 The women's box includes C. Booth Body Butter, Giovanni Cosmetics, Berry Plus natural laundry detergent, Funky Monkey Snacks, Zevia soda, Soy Joy bars, and KT Tape for treating those injuries (I already have a box of this waiting to test out). The men's box is filled with Good Clean Love, a natural and organic personal lubricant that's 100 percent vegan and paraben, glycerin and petrochemical free; Nature's Gate Cleansing Bar soap; Tylers acid-free coffee; Zenify carbonated drink; and StreamFit online workouts to give metabolic resistance training workouts without having to leave the house. And January's box sounds equally as appealing: TurboFire Greatest HIITs DVD, FRS Slim Chews, a LeBootCamp $25 gift card, Scheckter's Organic Energy, EAS Lean 15 Bar and Madecasse Chocolate Bites. Forget gifting these boxes, I want one for myself. I'm already thinking this is a great way to sample products I've heard about but was always too scared, or cheap, to buy on their own (what if I didn't like them?). Plus these boxes are popular. I swear they were giving them away at a race I ran this summer, but the boxes were gone by the time I tried to claim one (I was also stupid enough to think that I needed a voucher or money to grab one). Now I know why. I think I just solved my dilemma of what to get my sister for Christmas. But ssshhh...hopefully she's too busy packing for the holiday to read this. Want to order your own KLUTCHclub box? Click here to purchase a subscription for yourself or someone else. And cruise around the KLUTCHclub site to read all the fine details on the pricing information and how it works.